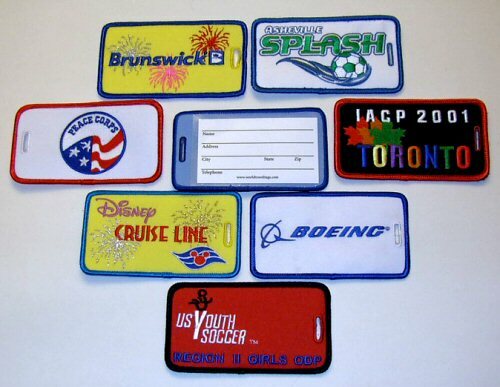 WORLD TRAVEL TAGS provides custom embroidered style luggage tags from your specifications for any type of group, e.g., tour groups, travel agencies organizing group travel, companies that wish to provide unique luggage tags for employees, sports teams, etc. Embroidered tags are constructed of heavy duty twill with up to nine embroidered colors displaying a name or logo on the front side of the tag and on the reverse side of the tag is a clear vinyl pouch that will accept insertion of a standard size business card or an ID card with spaces that allow for writing in name, address, and phone number. Included with each tag is a vinyl attaching loop which facilitates easy attachment to any suitcase or bag. Since quantity ordered effects cost for these tags, please contact with your specific needs so we can give you accurate pricing and production information.